“Samurai” refers to the warriors who put sword(s) on and exceled in swordsmanship, archery, equestrian skill, lance and gunnery, and served a feudal lord. 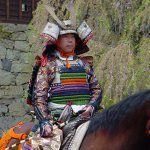 The word “Samurai” goes back to Heian Period (794 – 1185), and further the occurrence of Samurai itself has its inception in the military and civilian officials of Nara Period (710 – 794). Samurai in Heian Period were warriors in a high position and their role was protecting important people. Once the feudal system was established in Kamakura Period (around 1185 – 1333), samurai was tossed about by the waves of the subsequent war-torn era (1487 – 1615). This era is called “Sengoku” Period (the age of provincial wars) in which many “Daimyo” (feudal lords) fought battles with their neibour tribes. After the mid-Edo Period, since the war time had been gone away and the pacific era had come, those military arts became needless. Instead, they were acquired as the accomplishments of samurai. The word “Samurai” is derived from “saburau”, which meaning is originally “to serve”. 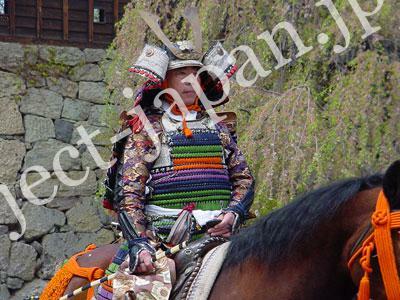 In fact, Samurai was “bureaucrat”. Swordsmanship and tactics were required, and based on “Bushido” philosophy, samurai conducted themselves. They had an idea of absolute obedience to their master and sacrificing their life. In Sengoku Period, regardless of not serving a particular person, all warriors were called “Samurai”. Mercenaries or masterless “Ronin” were often described as Samurai too. Even though the construal of the decency and the points of Bushido were different from each family, generally its main ideas were such as “Taking his life upon the behavior and the responsibility by himself”, “Serving his master at the cost of his life” and “Being prepared to lay down his life when he would have make a blunder”. From this concept of “Doing things at the risk of his life”, the “Hara-kiri” (suicide by disembowelment), dying to take responsible, came about in the Samurai culture. In the European culture, “Knighthood” is to be found. But the concept of admitting that he was respoinsible by suiciding was not seen in it. It can be said that the unique concept of “Hara-kiri” was maverick quality in the world. Bushido is often translated to “The way of the warrior”. Inazo Nitobe wrote the book “BUSHIDO” in which Bushido is what is composed of Rectitude or Justice, Courage, Benevolence, Politeness, Veracity & Sincerity, Honor, and The Duty of Loyalty. He also made reference to the moral character of Samurai, The Education & Training of a Samurai, Self-Control, “Harakiri” as the Institutions of Suicide & Redress, “Katana” as the soul of the Samurai etc. Bushido is identified as more of “The Beautiful/ Platonic way of living” than “The way of the warrior”. #We recommend to read “Bushido” once! You must be understand why Samurai could keep such a spiritual strength.